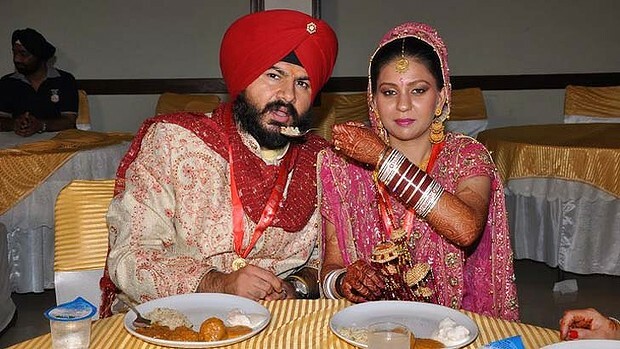 Avjit Singh and his wife Sargun Ragi at their wedding last year. THE death of 11 Indians in murder-suicides this year could have been prevented if the shroud of secrecy about mental-health problems in migrant communities was lifted, a psychiatrist says. Four out of five murder-suicides in Melbourne this year have involved Indians, and Australia India Society of Victoria vice-president Manjula O’Connor has warned the incidents are not isolated. Dr O’Connor, a consultant psychiatrist, said she had been researching domestic violence in the Indian community in Melbourne for the past two years and had been concerned that some families were suffering in silence. In the latest case that police are treating as a murder-suicide, Sargun Ragi was killed when her estranged husband Avjit Singh stalked her to her Kew home and torched the property on Thursday. Ms Ragi’s death came after nine Indians, including four children, were killed in three murder-suicides in a six-week stretch in May and June. ”I have been researching domestic violence in the Indian community since 2010 and I was worried these sort of things were going to happen because women were vocal about the issues that were going on in their home, but were not necessarily seeking help,” Dr O’Connor said. Dr O’Connor said she had established support groups of men and women whom Indians could contact if things got tough. But she said there remained an unwillingness or lack of awareness about such programs. She stressed that most Indian families had settled well in Australia and few Indian men were violent. ”These incidents are possibly triggered by marital problems, but a lot of the time it’s mental-health issues. Mental-health services are not being used by migrants and the Indian community is no exception. Indian consul-general S. K. Behera said the latest incident did not change his perception that murder-suicides were isolated events that could not be attributed to any issues specific to Indians in Melbourne. ”Such unfortunate incidents are really a matter of concern for us. The police are investigating the latest case. Let us wait for their finding,” he said. Dr O’Connor emphasised that while all the incidents involved Indians, they involved some who had lived in Australia for a long time, others who had recently migrated, and some that had come via another country. There was also no similarity in religion or area of origin in India. Mr Singh, a taxi driver, had been in Australia eight years, but his wife had only recently arrived on a spousal visa after their marriage in Punjab last year. Police are not investigating any link between the four incidents.